My son is really excited to be home from UNC and that I picked up some New York Strip steaks to grill for dinner on this fabulous fall evening. Is the steak done yet? No. It takes a while to make a really great grilled meal. Getting close though. These are New York Strip steaks without the bone. You can also get NY Strip bone in. 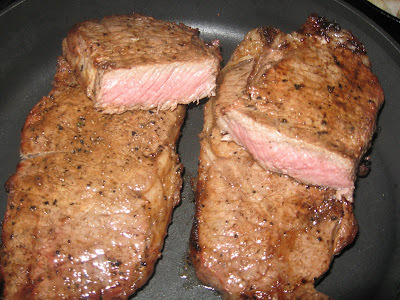 New York Strip steak is best done to a perfect medium as you see here after I cut one of the grilled steaks in half. Yehaw! My son is in for fall break from UNC Chapel Hill. This is his first year at college, and he has lost 20 pounds with all that walking on campus and with cafeteria food instead of Momma food. I had in mind to get some Rib Eye steak. That's what my boys love the best. Rib Eyes are not called guy steaks for nothing. They are hearty with great fat marbling and cook up very tender. Alas, my local Food Lion only had two packs of Rib Eyes, and they were not prime. Too much fat streaking. That's different from the marbling. I really didn't want to pay top dollar for the dregs. I did ring the bell for my meat buddies. Really they help me out a lot, and I often ring to get help. I asked if they had any Chuck Eye. That's just the end pieces from the Rib Eye. They're smaller and usually fairly inexpensive, but there's just a few packs of those, since it's the small end off the Rib Eye. Anyway, no dice. New York Strip was on sale. Still expensive - of course. But, I could get four beautiful steaks for $24. The main difference I find in grilling New York Strip versus Rib Eye is that it's important to go for medium rather than medium well. Overcook New York Strip, and it's pretty dry. It's also a good idea to marinate New York Strip. Well, it seems to help any cut of steak. 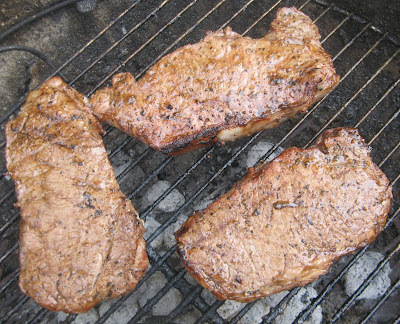 My basic grilled steak recipe works for any cut and is really tasty. I'm pretty accurate on my grilling. Well, I ought to be. 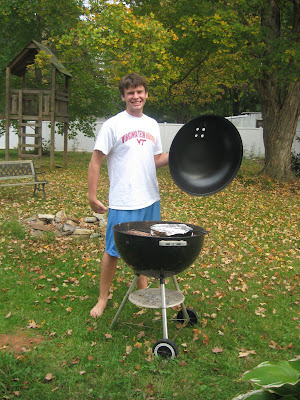 I grill all the time and write on grilling. I hit these New York Strips right at medium and pulled them off. You can see in the photo above the amount of pink that would be optimum for a medium on these steaks. Of course, you may have guests who love rare or well done. That's fine. But, if you want New York strip at its best, then you've got it at medium. To tell when the steaks are medium, press down with tongs or a turner. The steak should have a little give like the skin between your pointer finger and thumb. You can also cut a steak and check. You'll hear that you shouldn't do this, but when you're learning, it really does help. Once the steak is seared, you really don't lose much juice and flavor if you do a quick knife check when you think you're getting close. Along with the New York Strip, I did cast iron grilled hash browns. I do buy the throw-away foil pans sometimes, but those are kind of expensive. The cast iron skillet works great on the grill and is none the worse for the use. Unless I need to make a really big batch of grilled potatoes, then I use my cast iron skillet for grilling. I also stuck on some heat and serve rolls wrapped in tin foil and buttered. I just put those on the last five minutes or so to heat them and melt the butter. The entire meal was grilled outside, since it's pushing 90 degrees here and mid October. Hated to heat up the house and have to turn on the air conditioning this late in the season. We're supposed to drop down to the 40s by the weekend. North Carolina. If you don't like the weather, stay an extra day. You'll have something different. Both boys loved the New York Strip steak and sides. The dog was excited about the little pieces of fat. Not much - but enough for a small treat. Tomorrow I'll shift over to some of our indoor favorites, since the weather is changing fast. I have a pot roast thawing and got the stuff to make Chex Party Mix. 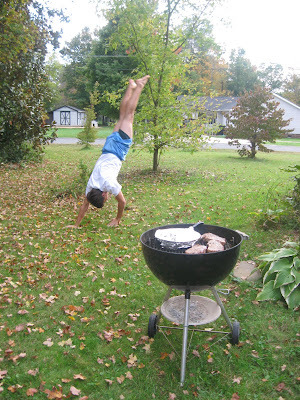 My son may do another hand stand, since he adores Party Mix.